The team at Showtime on Tuesday announced the arrival of Showtime Anytime, an iPad application that allows Verizon FiOS and AT&T U-Verse customers to watch hundreds of Showtime TV shows and Movies for no additional charge. The program is meant to compete directly with HBO GO and MAX GO programs which also allow users to watch TV shows and movies directly from inside their iPad devices. Customers are required to log into the new app using their cable provider account, typically within the customers home, ensuring that passwords and user accounts are not shared and users do not figure out ways to provide free access to friends and family. In the meantime Showtime has promised that the Showtime Anytime application will arrive at other providers including Comcast in the near future. 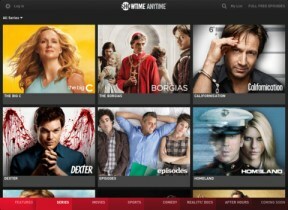 Do you plan to take advantage of Showtime Anytime for your iPad?